This article by Ann Robertson and Bill Leumer is re-posted from ZNet. 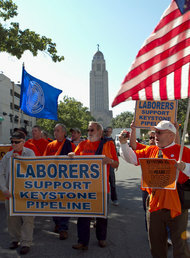 With less than transparency, the AFL-CIO just issued a statement endorsing “expanding the nation’s pipeline system.” Although it did not explicitly endorse the Keystone XL pipeline, the labor federation nevertheless managed to extend its blessing to the project while hiding behind vague generalities. However, the logic of its position is unambiguous: the federation is in favor of extending pipelines in general and without qualification; the Keystone XL is a pipeline. Therefore logic compels us to infer that the federation supports the extension of the Keystone XL pipeline. The duplicity of the gesture is entirely intentional. The building trades unions have embraced the pipeline and have lobbied the AFL-CIO to do the same. However, the AFL-CIO would prefer not to alienate its environmental allies, who strongly oppose the pipeline. For this reason the federation refrains from mentioning the Keystone XL by name. But its vague generality is just enough cover to provide President Obama with an excuse to support the pipeline, which his administration’s State Department has already secretly embraced. Obama can now point to disunity among his liberal supporters as a justification for ignoring them. He can do exactly what the corporations want while pretending to be unable to satisfy the conflicting and inconsistent demands of the liberal left. The AFL-CIO hides behind language, and Obama hides behind the AFL-CIO. Obama has been in desperate need of this cover. Thanks to the Freedom of Information Act, we know that in 2011 his State Department was engaged in its own duplicity by sending encouraging emails to a representative of TransCanada, the company seeking to build the pipeline, while at the same time supposedly conducting a neutral investigation into the pipeline’s environmental impact. We seem to be caught in an irreversible downward spiral. Money translates into power, thanks to lobbying and campaign contributions. When wealth becomes concentrated in the hands of corporations, power becomes equally concentrated. For this reason, corporations have been particularly successful at imposing their agenda on the rest of society. They have successfully attacked unions and thereby lowered wages, eliminated safety regulations and reduced benefits; they have undermined public education by defunding it and by promoting charter schools that have a dubious record of success; they have undermined health care by insisting that profits be prioritized over the welfare of patients; they have torn the safety net by campaigning for a reduction in government spending; and they have placed the survival of the planet as we know it in jeopardy by refusing to curtail the consumption of fossil fuels. The 1% surges forward at the expense of the 99%. The 99% will have no chance of halting this corporate onslaught by playing the corporate game of money and power. Although labor unions have money, their resources are miniscule compared to corporate reserves, so labor’s attempts to beat corporations at lobbying and campaign contributions have yielded paltry results. In fact, the standard of living of working people has been steadily eroding and has been both the cause and effect of a declining union membership. However, organized labor has far more powerful resources at its disposal, if it will only take advantage of them. By embracing the philosophy that served as the foundation of their origin — “an injury to one is an injury to all” — unions could begin to organize and mobilize the 99% in order to create a powerful movement capable of sweeping the country. Such a movement would draw its power and inspiration by occupying the moral high ground: unions would not only fight for their members’ interests, they would fight most tenaciously for working people in general, especially those most in need. They would demand that the government institute a public works program like those in the 1930s that would create good paying jobs for all. They would fight for the protection and extension of Social Security and Medicare, protection of the environment, amnesty for undocumented workers, fully funded public education and social services, all to be paid for by taxing the rich. In this way the unions could begin to create a movement of millions. They could transform the current culture of corruption, where it is all about special interests, backroom deals, money and power. Only such an independent massive movement has the chance to shift the balance of power in favor of the 99%. But in order to spark such a movement, organized labor will have to abandon its current, doomed trajectory where it responds to its continually declining membership by redoubling its efforts to mimic the backroom cynical deals of corporations. It will have to trade in manipulation for inspiration and money for morality, including reducing the inflated salaries of many of the top officials. And it will have to give up its pretense of putting up a fight, where lip service is given to some good cause and a small, ineffectual rally of a few hundred is organized to supposedly promote it. Instead, it will have to put up a real fight by bringing millions of people into the streets to place their demands on the government. Above all it must never try to advance the interests of its own members at the expense of other working people and of the survival of the planet. By offering support for the Keystone XL pipeline, the AFL-CIO wins a few construction jobs and a little money; but it sacrifices everything of value.